We've been working on a bunch of new features for the Modkit Editor, and we're releasing them today as our first Feature Friday. We have a lot more planned and hope to make this weekly thing. The connection status is now shown in the bottom right corner of the editor, and show if the desktop app is successfully connected to the editor. If it's not connected, make sure your Modkit Desktop app is running. In Windows, the desktop app icon will appear in the system tray/taskbar on the bottom right side of the screen (some icons may be hidden, click the little arrow to show them all). On a Mac, the desktop app icon will show up in the top right side of the menu bar (near the clock). We're still working out some bugs so if the desktop app is already running, but the editor connection status doesn't say "connected", try restarting the desktop app and/or reload the editor. Speaking of bugs, we're hard at work making things more stable, but if you are having problems with the editor or desktop app, we've added a feedback form so you can send us your bugs right in the editor (if you happen to have a bug with the feedback form, you can always send feedback to bugs (at) modk (dot) it). Awesome. Thanks for the update. Any word on the official crimp cards? Hi guys, congratulations for the project so far, it looks great! 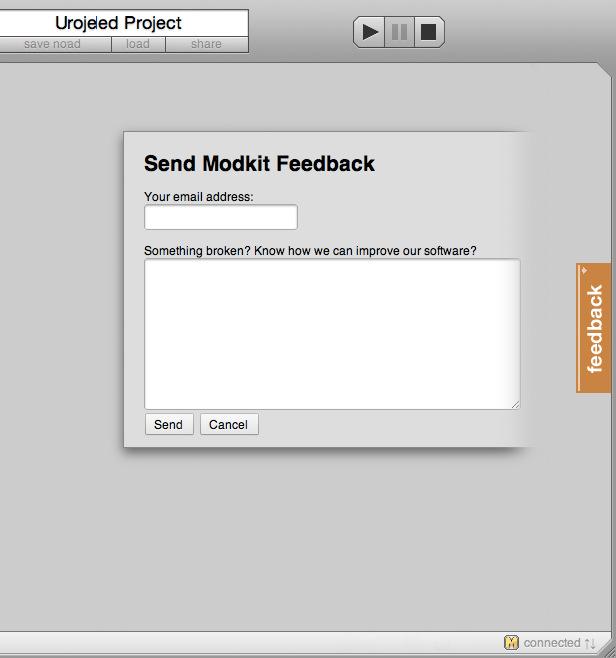 I have a hard time waiting to be able to use Modkit with just an Arduino (and to set up my own boards). Will be available blocks to control servos, using the Servo library? Also, will be available blocks for motor control, with configurable Dir and PWM pins, similar with your MotoProto Shield? Also, will Tone be available? 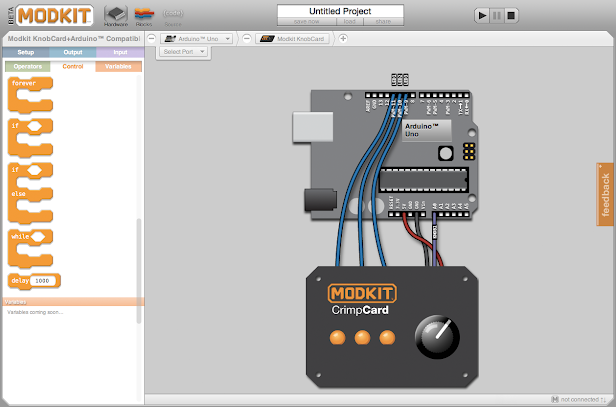 I think Modkit will be very popular if will be easily configurable, so the user has total independence on what hardware he uses and if most (if not all) standard Arduino libraries will have code blocks. great love the update, i am glad to see it, keep up the good work. i am looking forward to your support of more arduinos. I hope the latest post answers most of your questions about features for standard Arduinos etc. We'll be releasing more features soon, so stay tuned.